Most personal trainers are taught the RPE scale during their PT course and it’s an important part of the practical assessment. However, many trainers report that they don’t use it religiously with their in-person clients or forget it completely as soon as they start working. There is nothing necessarily wrong with that. When you train a client face-to-face, you develop a relationship where you will be able to see if an exercise is too easy or too hard for them. Alternatively, you can ask them there and then and adjust the intensity on the spot if needed. How do you know that your online coaching clients are working hard enough or don’t overdo it when you don’t have that kind of connection? It’s imperative that you want to know that they work just at the right intensity for their fitness goals. If they don’t work hard enough, they may not progress towards their goals and stop working with you. If they work too hard, they may not recover properly and get injured that puts them off training for some time. Bottom line: as their online personal trainer, you will want to know they are on the right track in every aspect, including exercise intensity. Gunnar Borg, Swedish Clinical Psychiatrist introduced the field of perceived exertion in the 1960s and created the Rate of Perceived Exertion (RPE) scale in 1982 to help people assess how hard they perceive their exertion when performing different activities. In brief, the also called Borg Scale scores between 6-20, roughly in line with a healthy adult’s heart rate zones where 6 is rest (~60bpm) and 20 is maximum exertion (~200bpm). Later a modified 1-10 scale was introduced which is more popular today among personal trainers, strength coaches and fitness enthusiasts. If you think about your own training regime. Do you ever have days when the exact same workout gets you more tired than other days? I suspect the answer is yes, especially if you are a female personal trainer. It’s no different for your clients. How tired people get from a workout will depend on many aspects, including sleep pattern, stress levels, nutrition, other activities in their day and for women, on their cycle too. Keeping the workouts rigid to weights or speed they need to hit may not work them hard enough on certain days or may push them into overtraining on others. Introducing a subjective measure that takes other parameters into account will be a game changer in how your clients feel after their workouts and even in the results they will get. Think of it as optimising their already tailor designed workouts for accelerated progress. How to Introduce the RPE Scale? Providing people with the description of the scale will be the first step, but you will also need to take them through some paces, so they have a concept of what feels like max effort and what feels like no effort at all. This way you can ensure that once you start them on their programme they will have the right idea about the scores. Think of a new online personal training client who has never done HIIT training and most of their activities revolve around dog walking, gardening and maybe some jogging. Their perception of maximum effort will be different from that of a CrossFit athlete or a someone who is into powerlifting. The example is about the extremes, but you get the idea. So, before you can start using the scale, you need to help your clients establish their real markers so once you start working together, their perception will be a reliable measure for programming. Starting your new client with a week of workouts at varied intensities will help you create their own perception of the RPE scale. Their task for that week is to perform the workouts and associate each intensity to a number on the scale. For example, their cardio for the week can consists of a 30 min walk, cycling or jogging and a short HIIT workout. You can also create their strength workouts at different rep ranges, including exercises where they work till failure, so they have an idea how that feels. How to Apply RPE for Aerobic/Cardio Workouts? Understandably, the programming will depend on the specific goals of each of your clients. If you train mostly the general population, they will need to perform CV training to some extent. With general health and weight loss goals, hitting all three intensities in a combination is a good idea. Using the RPE scale will help your clients to progressively increase the intensity of their cardio workouts to become fitter and healthier. A great example for this is a high intensity circuit workout. People who are more conditioned will likely fly through, while someone who has never done it and tries to keep that same pace may end up feeling sick or fainting after a few minutes. Let them decide when they need rest based on RPE and program their workouts, so they will feel energised rather than feeling like they were run over by a truck. How to Apply RPE for Strength Workouts? The fitness industry is lucky Mike Tuchscherer worked this out for all of us. He created the system (Reactive Training Systems) where the RPE is defined by how many repetitions you think you could still perform with the same weight before failure. The article discussing how to customize your RPE chart is focused on powerlifting, but with a little flexibility you can apply this to the strength training workouts for your clients. They don’t have to be powerlifters to apply these principles and understand how their body can be trained in way that it’s worked hard enough for strength gains, but not too hard to inhibit recovery. 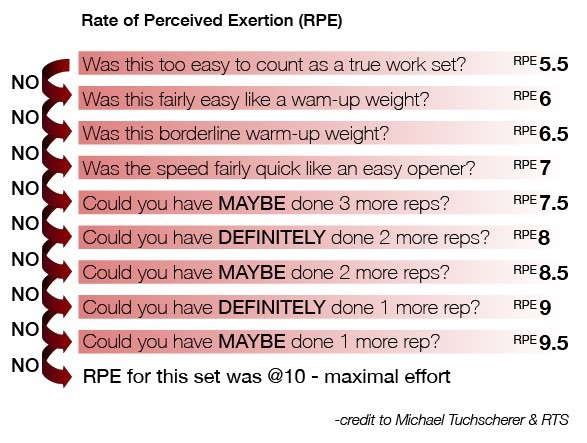 Here’s a simple chart you can pass onto your clients, so they have a great idea how to assess their RPE when lifting weights. In brief, introducing RPE into your online personal training programming is a great way to nail down how hard your clients are working during their sessions. While using HR for the same purpose is not a bad idea either, not everybody has a heart rate monitor available. RPE is free and once anchoring is completed it makes the communication between you and your clients about the perceived intensity of their workouts much easier.